Your Commitment to corporate sustainability means operating under a set of ethical values that respect people, their communities and the environment. But do your global suppliers, distributors and employees share that commitment? Are they equally concerned about human rights, labor standards, environmental protection, corruption and supply chain security? 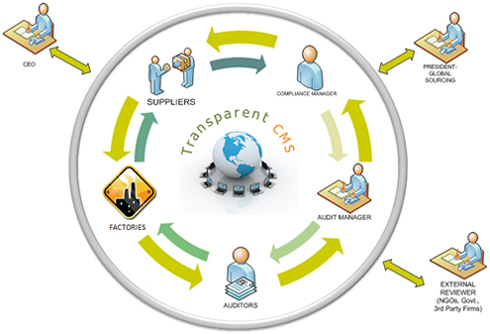 TransparentCMS enables you to manage the compliance assessment process by minimizing risk while maximizing compliance, and promoting collaboration and transparency among all sustainability program partners to increase your bottom-line growth while contributing towards a sustainable planet. As you take a closer look at TransparentCMS, the following illustration will help you see how we support and bring people in various roles to work together to achieve compliance goals.